You are here: Home / General life / Happy Birthday Blog! But of course my children took it upon themselves to blag on me, as kids do, by telling my close friend @nicola1979smith. This then came up in conversation with another close friend @crazymumtofour during sports day. From there on things got a lot less secretive! 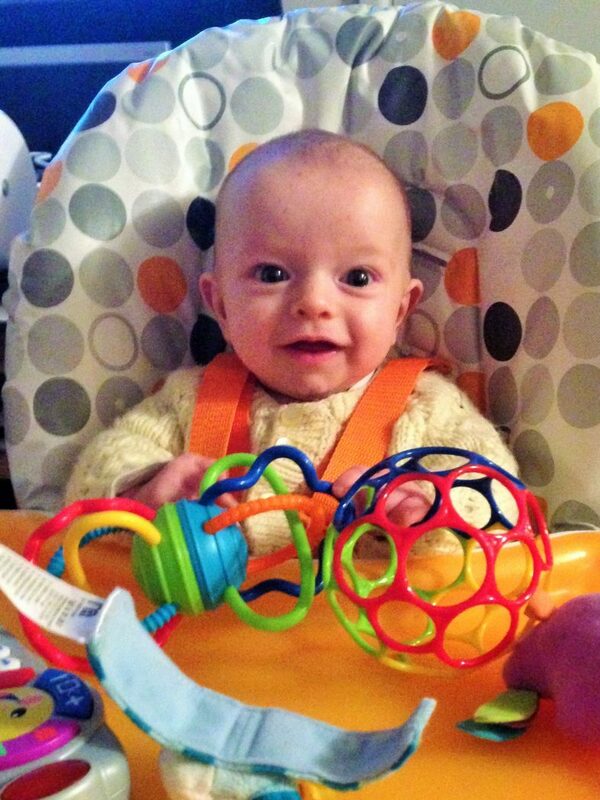 First time in a high chair! I would love a day where all the kids were nice to each other and they just did things to help out without needing to be asked. A day that was sandwiched between two full nights of sleep for everyone and where food just magically appeared on the dining table and the dirty dishes disappeared just as fast! 2. Which blog have you most enjoyed writing? Gosh,I don’t know! I think it would probably have to be ‘A day in the life of a breastfed toddler’. I was actually really poorly that week and probably quite delirious with a fever when I first started writing it but it made me chuckle when I was editing it! 3. How do you juggle blogging and being a mum of 5? Most nights my kids are all in bed by 9pm so I pretty much try and write then. Day times are pretty much out of the question but there are occasions when the older kids will take O upstairs or outside to play and I have to be honest I often whip out the laptop to blog a bit then instead of the housework I was planning to do. 4. What is your favourite day of the week and why? 5. What is your favourite blog to read and why? 6. What blogging achievement have you been most proud of in the past year? 7. What would you like to achieve in the next year?! I would love to be nominated for one of the blogging awards. I don’t care if I get through to the shortlists or anything, just the feeling of being nominated would be wonderful! I’d also like to get nearer, if not in, to the top 500 of the Tots100 charts. 10. What question do you really hate? When E&Ff were little I used to hate the ‘are they twins/identical?’ Now they are older we get the ‘Are they all yours?’ or ‘do you have a TV?’ type question. These really annoy me. happy blogiversary!! agh i get the do u not have a tele question what do you say to that when its from your oh’s grandad! Thanks 😀 I don’t think I would have known where to look, let alone how to reply! Sarah Christie recently posted…Labels, How Do They Define Us? I especially love the “cheese question” as a chat up line – reminds me of when I did speed dating. I am sure you must get nominated for a blogging award within the next year! hehe, some fab questions – so lovely to read more about you. I love finding out about the people behind the blogs! Great questions and answers, I love posts like this when you really get to know the person behind the blog and what makes you, well you. I honestly have no idea how you manage everything with 5 kids – hats off to you!